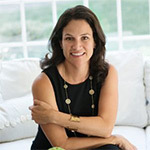 Julie Stein has over 15 years of experience designing homes. Whether building a new home or redecorating existing spaces, Julie designs homes that are comfortable yet sophisticated, and are able to change with the client’s needs through time. She believes the home is the ultimate reflection of the client and should be a place of relaxation and inspiration for years to come. She enjoys entertaining and appreciates the home as a place to share fun times with loved ones. Creative problem solving has been a lifelong passion for Julie, so creatively designing a space that works best for the client’s needs, within a manageable budget, is at the center of her design philosophy. Julie has a clean, uncluttered aesthetic — blending materials, palettes and styles for added interest. She is noted for her keen eye for detail. Adding the unexpected, creating a little spark, and making a home glow, is her ultimate satisfaction. Many clients return to Julie for additional projects — renovations, vacation properties, additions, or moves to a new home. That is a great compliment of her work, and she strives to build these lasting relationships. Julie graduated with a Bachelor of Arts from Duke University. She initially worked in the financial sector in Manhattan, then in 1997 decided to pursue her lifelong love of art and design at the New York School of Interior Design. Since the late nineties, Julie has worked with clients primarily in the Metropolitan New York area, Connecticut and various vacation destinations. She lives with her husband, Sandy, and their three children in Wilton, Connecticut.